The Accessible Parking Only R99 (CA) sign in combination with MINIMUM FINE $250 R99B (CA) plaque; or, Accessible Parking Only Minimum Fine $250 R99C (CA) sign shall be used in on-street and off-street parking facilities to designate stalls for vehicles with a special identification license plate or a distinguishing placard for persons with disabilities. The importance of height placement and the location of your signs plays a huge role in preventing inattentive pedestrians from accidentally colliding into your street signage. You should always keep in mind that any sign that you post needs to be high enough to prevent these type of mishaps. Where sign R99C (CA) or sign R7-8b are installed, the bottom of the sign or plaque panel needs to be a minimum of (7'-0") above the surrounding surface where the sign is posted. The R99 (CA) sign in combination with the R99B (CA) plaque; or, R99C (CA) sign, blue pavement markings and International Symbol of Accessibility Marking, are required for enforcement of these parking areas. Refer to the legislative vehicle code CVC 22511.7 and 22511.8. 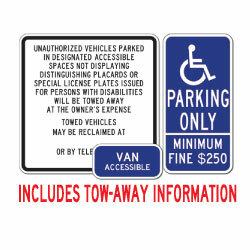 DOUBLE the working life of your California Disabled Parking Signs by adding 3M Protective Overlay Film (POF)! 3M’s high-tech POF protects sign faces against fading caused by the sun and harsh weather—and makes graffiti and sticker defacement damage easy to clear away without harsh abrasives.